Click on ECG for Everyone to watch a video on how to easily identify all ACLS arrhythmias and how to use the ACLS algorithms to treat them. Atrial Flutter is a type of supraventricular tachycardia caused by a re-entry circuit in the right atrium. Depending on how big the right atrium is the length of the re-entry circuit. Because the re-entry circuit is approximately the same length each time the atrial rate is usually relatively fixed in a particular patient. 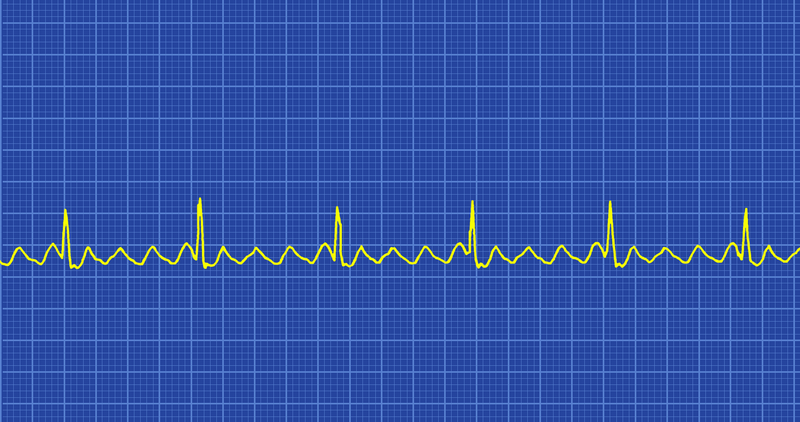 Atrial rates in atrial flutter range from 200-400 with most patients around 300. The ventricular rate is determined by how many electrical impulses make it through the AV node to the ventricles. Usually there is some degree of AV block resulting in a ratio of 2:1, 3:1, 4:1, etc. of atrial contractions to ventricular contractions. Because the atria are being stimulated so frequently they twitch more than contract which results in inefficient pumping of the blood into the ventricles which then results in blood pooling in the atria. The most common atrial flutter rate is 2:1 however if the block is higher (caused by cardiac disease or medication issues) lower rates of conduction to the ventricles occur resulting in ratios of 3:1, 4:1, or 5:1 more. Atrial flutter with a 1:1 conduction rate can occur if there are accessory pathways especially if AV nodal blocking agents are administered to a patient with WPW. This 1:1 atrial flutter is associated with a severe hemodynamic instability and early deterioration to VF. Atrial Flutter is a regular narrow-complex tachycardia with an atrial rate of 200-400 and a ventricular rate that is a fraction of the atrial rate. For instance if the atrial rate is 300 and it is at a ratio of 3:1 the ventricular rate would be 100. There are technically no P waves, however the F-waves look similar to P waves. They are saw-toothed and regular in appearance. Sometimes turning the ECG upside down makes it easier to identify the saw-toothed pattern of the F-waves (flutter waves) in a lead II ECG. Since Atrial Flutter results in poor pumping of the blood into the ventricles, the faster the atrial rate (just like Atrial Fibrillation) the more serious the symptoms and complications. After 48 hours there is concern of emboli creation and expulsion from the heart and rapid ventricular rates can result in cardiac failure. Hemodynamic instability and deterioration into Atrial Fibrillation and possible cardiac arrest can occur. For the moderately to severely symptomatic patient resulting in hemodynamic instability it is important to prevent further serious complications with early synchronized cardioversion. For patients in any unstable tachycardia the treatment is synchronized cardioversion. Drugs are not used to treat unstable tachycardia. Since Atrial Flutter is more responsive to electrical cardioversion than Atrial Fibrillation a lower dose is recommended. A dose of 50-100 Joules is the recommended dose for Atrial Fibrillation for synchronized cardioversion of the hemodynamically unstable patient. Vagal maneuvers and adenosine are not usually effective to convert Atrial Flutter to a normal sinus rhythm but they slow the atrial rate enough to make it easier to see the flutter waves enable correct identification of the rhythm. Treatment of reversible underlying causes is important as in all arrhythmias. See the Underlying Causes of Cardiac Arrest H’s and T’s for more detailed information on identification and treatment of common underlying causes.